A fast and maneuverable little skiff she is ain't she? The Captain swigged another swallow of Bru-Haha seemingly talking to himself. Meanwhile the crew was busy running drills on the new guns they just acquired at rock bottom prices from a friendly pair of smugglers in a rowboat. She even got a lovely stern doesn't she boys? Again it seemed the Captain was talking to anyone who would listen. Captain seemingly drunk: Oh she's a lovely little Petunia with a pirate crew... With a Pirate Crew... With a Pirate Crew... Oh she's a lovely little Petunia ... With a Pirate Crew ... Oh won't yee come and sail with Meeeee! OoC: this ship will be featured in a later build comments and criticism welcomed! The only image I could get to render! Lovely little boat you've got here! Nice job on the sails, they catch the wind quite nicely! I like the way you did those sails. But she is a bit skinny in the belly. nice for sailing fast straight ahead, but she'll be not so nice in bad weather. Nice boat, I like it! It must a swift sailer, by judging it's sleek line. Thanks... This all started to "fit" a 48x48 scene... Then the scene expanded to 64x64 so I completed the whole ship lol not just the stern. 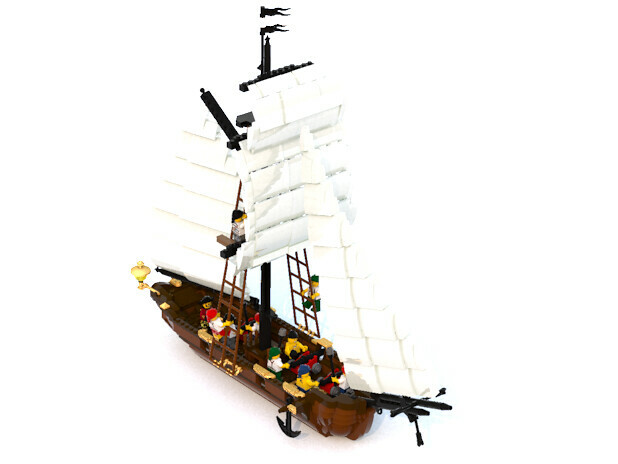 Great Ship @Roadmonkeytj, I really like the detailing and classic pirates look of her. Great work, and soon I'll need to get my own armada up. Thanks! I tried to keep it simple but detailed so it wasn't the center piece of the larger build I was building! Your ship skills are improving... Just keep trying new techniques!